Does Walmart’s Savings Catcher Work? As I was listening to some tunes via Pandora last week, an ad for Walmart’s Savings Catcher came on. They advertised that you could enter your receipt into their new “Savings Catcher” app and if they find a competitor’s advertised price cheaper than what you paid for it at Walmart, they’ll actually refund you the difference in the form of an e-gift card. The idea sounded interesting, so I gave it a try on a recent short shopping excursion. My first impressions of their Savings Catcher were a bit mixed. According to a recent report on the new initiative, the Savings Catcher is a bit of a PR move by Walmart. And, they are rolling the program out in only some markets. Where I live – Walmart has heavily invested into trying to persuade folks to ditch their regular grocer for Walmart’s, for well over a year now. The Savings Catcher seems to be another effort in that campaign to say, “See, told you we’re cheaper“. You can log into the Savings Catcher website by using your existing Walmart account (if you have one – I have used them in the past for really affordable photo reprints) or by creating an account at the site. Once logged in, you’ll be prompted to enter the “TC code” found at the bottom of your receipt and the purchase date. Easy breezy. You’ll then get a notification via email (and on-screen) that the whole “price-check” can take up to 72 hours. Now, this was a bit of surprise to me – but I guess if they are checking competitor’s advertised prices nearby, it could take some doing. And to be fair, the app is still in Beta. To review the app, I decided to pick-up 9 random items we routinely purchase, from toilet paper to bulbs. And, I wanted to do my own “price-check” at a nearby Target store. Walmart regularly seems to price their items at – say – $2.97, instead of $2.99, so I thought they would always beat the competitor. And after I double-checked my items at Target, I did find that Walmart was – on the whole – cheaper. Though, there was one item in particular which was cheaper at Target and I was intrigued to find out if the Savings Catcher would catch it. The “control” item would be some deodorant that I purchased at Walmart for $2.47. At Target, it was on-sale for $2.24. I entered my receipt at the Savings Catcher app online and then waited 3 days. I never did get an email notifying me the “price-check” was done. But, once logged in, I noticed it had been completed. It told me that it did not find any items cheaper elsewhere and even missed the deodorant, pricing it at Target for $3.49 (instead of the $2.24 sale price). In reality it only was able to check 2 items, as the other 7 weren’t advertised. So, on the whole, I would say the Savings Catcher has a little bit of work left and seems to be more of a “gimmick” than something that is here to stay. But, who knows, maybe if I were to check more items, I’d get a different result. I’d love to know what’s been your experience with the app and if it found savings for you elsewhere? UPDATE 4/17/14: Since we published the post, a representative from Walmart has contacted us and indicated their team is continuing to develop and improve the Savings Catcher app. And that – at this time – the app only checks competitor’s advertised prices. The price of the deodorant I mentioned in this post was an “in-store” promotion only (and therefore, not an advertised item). UPDATE 8/4/14: Savings Catcher now includes all produce, more general merchandise, has an app for iPhone and Android and is now available nationwide. Beginning February 14, 2015, we are removing some departments consisting mostly of items that do not have a like for like match at other retailers, such as produce and bakery items. Additionally, we are limiting our comparisons to offers of other mass market retailers, grocery and dollar stores, removing comparisons with drug stores. Is Walmart Neighborhood Market More Expensive? I’ve been using the Price Catcher for about a month now since I do a great deal of my shopping at Walmart. So far zilch, nada, nothing! Not so much as a penny have I received from this PR gimmick. The fact that you’re using Pandora sends up a red flag immediately. The Walmart Saving Catcher does work at it is a savings for the most part, EXCEPT: Do NOT let your Saving Amount exceed $50.00 or $60.00 in total before you to the one of the two optional cards or Walmart will start screwing you out of .10 to .20 cents from every savings catcher receipt you submit, writing to them does not good it is just ignored and never answered and never fixed and you do not get any adjustments even when you send them the proof of receipts! I had over $90 in rewards and when I cashed it in for the e-card I never received the email and could never get anyone to answer me. Rip off. Do NOT trust Walmart Savings Catcher for expensive items! Walmart Savings Catcher Do NOT work for expensive items or eletronics. I bought a LG TV model # 43LF5400 on 1/30/2016 for $298+tax=$318.86. The exact brand new TV was on sale for $277.99 at Sears and on Amazon(free shipping) that day. When I told this to the sale representative at Walmart, he told me that I can get the difference back from Savings Catcher. So, I bought the TV at Walmart instead of at Sears or Amazon that day. I came back home and entered the Savings Catcher receipt information. I also saved the website price description on Amazon and google sale price listings for Sears just in case. I did not get the $20.01 difference as promised. Walmart Savings Catcher has no service phone number, so I wrote them. It’s been two weeks without reply. I’m never buying another expensive item at Walmart if there’s a better price elsewhere. So..Y don’t you just return it bk to the store and get ur money back if ur not happy? O.o..You have 15 days to return electronics I believe. Yes it does work if you are consistent & do the majority of your shopping at Walmart. Due to where we live in Kansas, Walmart has flushed out the smaller stores where we use to shop, which leaves only Walmart to go to. (Which is unfortunate). My husband & I were adamant about keeping & scanning each receipt right after shopping, including any Walmart trips we encountered while traveling. Over a year we had saved $38 which Walmart applies to a gift card which can be easily used or scanned for further purchases. Since we are all about saving money, the Walmart Savings Catcher did pay off over the long haul! I generally abhor Walmart on ethical grounds, plus I find shopping there to be a distinctly unpleasant experience. However, when I recently learned about the Savings Catcher program, I did some research to see if it could be gamed to my advantage. The bottom line of my efforts is that this program could potentially have some minimal value if and only if one already does the majority of their shopping at Walmart. Given the considerable amount and degree of restrictions built into the program, and the utterly opaque nature of their alleged price-checking (which cannot be disputed by a consumer in any practical, realistic manner), Savings Catcher is ultimately just a self-serving variation on Walmart’s long-established Price Match Guarantee. The main difference is that rather than saving money up front or receiving a cash refund by presenting ANY competitor’s lower advertised price on ANY identical item with Price Match, a consumer can -with roughly the same amount of effort- receive *store credit* for the price difference on a certain, small percentage of products; from a limited list of competitors; several days later by using Savings Catcher. Most hilariously of all, however, was the difficulty I had researching this program’s practical merits without actually participating in it, which was to such a degree that I’m nearly convinced Walmart is doing it on purpose. I tried to find qualifying items from Target’s current printed weekly ad book that were on sale, then see how much they’d cost at Walmart. The vast majority of items (8 of the 10 that I checked) on which Target had considerably discounted sale prices were mysteriously “Out of Stock” at Walmart- both online AND at any of their stores! These were very common items, such as 12-packs of Pepsi cans and Aquafina bottled water, yet every variety that Target had on sale was out of stock at Walmart. Interestingly, the Target sale items that Walmart *did* have in stock were those that were only a few cents cheaper at Target, while those that cost significantly less were invariably out of stock. Of course, this was only a quick skim on my part -not at all a conclusive, much less scientific, study- but still… The bottom line, again, is that Walmart’s latest gimmick is just that: actual savings are strictly limited by the array of restrictions, and any that *are* garnered must be spent at Walmart, ensuring/forcing consumers to keep coming back. On an almost completely unrelated note, I must commend your exceedingly polite reply to the comment from “Tanae M Otis,” who seems to think that you &/or your blog somehow ARE Walmart, and/or that you specifically represent the “saving catching department.” Although her(?) hilariously illiterate; highly-detailed, self-righteous, yet entirely nonsensical; and overall patently absurd ravings *did* have some entertainment value, no reasonable person would’ve blamed you for simply ignoring -or even outright deleting- the comment. However, like a true gentleman, you succinctly and graciously suggested an obvious, sensible course of action, despite knowing that it’d almost certainly not be heeded. Kudos, sir; you are a rare breed. Your saving catching department is a lie and a scam. Which I have contacted and the development is refusing to stand by their word. In King Soopers September 23 – September 29 ad on the very last page it states febreze air effects 9.7oz 2.99-1.00=1.99 when you buy one card & digital coupon.I bought 2 from Walmart and it wasnt adjust by the saving catching department. they lie and say the can see an ad but claim don’t see the ad they emailed me saying “We have checked our records and found that you received the correct amount that you should have been given back through our program. Our price was $2.97 while King Soopers price was $2.99.” Which is a lie because I still have the ad which states 2.99 (in store price) -1.00 w/ online coupon or store discount card = 1.99 that’s .99×2=1.98 is what I am owed. I still have the ad and pictures. I’d recommend contacting Walmart directly. I’ve been using the catcher for 1 month now and it worked on the first three receipts, but 0.00 for the last 10. I saved $20.00 on three receipts but nothing after that even though I bought a duplicate item that gave me a big savings on the first receipt but nothing on the second purchase. It feels like a hook to me. I will go back to checking various stores on my own and not leave it up to Walmart. 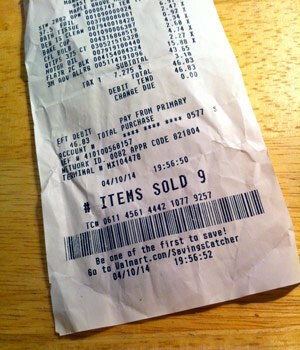 I have used the savingscatcher 3 times now – twice after shopping Wal-mart for my regular large weekly shopping. I normally do not buy the bulk of my groceries there, but like you, I was curious. My experience was pretty positive. On all of my trips about 30% of the items were “matched” against someplace else’s advertising, and the majority of the time the prices at Wal-mart were lower. Maybe I just got lucky but on one of my trips cereal was on sale somewhere and I got about $5 in credit back. Over the 3 trips, I am up to about $6.50 in credit. The one thing I do like about it is that they compare to “dollar” stores and drug stores where I would never normally shop for groceries – even if I saw a sale advertised. Thanks for sharing your experience with it Jim. Of the positive experiences I’ve heard with it – people have spent more than I did. “The fox guarding the hen house”. Funny. :-) This intrigues me because I shop at Walmart a lot. I’m going to give it a try. I’ll do a 30 day challenge and then let ya know, huh? Be great to hear how it works for you Laurie! This is a new idea and I am glad that you tried it out. Thank you. It does seem more like a pr grab than actually helping. It’s not really a feature I use (I probably should! ), but this has been around for a while now in ASDA in the UK, which is owned by Walmart. As a result of its success, competing chains set up their own version offering similar rewards. Hi Aaran. It’s definitely an interesting concept – just think it needs a little more work.